Oly Works LLC is excited to bring to our reading public a new publication based in the South Sound. (Olympia, WA) Oly Arts, a new publication focusing exclusively on arts and culture in the South Sound, makes its debut this month. The publication provides comprehensive coverage of local theater, music, visual arts, and cultural events. Oly Arts is a multi-platform publication: an online version at OlyArts.com publishes regular updates on performances and local arts events, along with a mobile app for various platforms. Readers can subscribe to both a weekly newsletter as well as the quarterly print edition. The full-color print edition of Oly Arts will first appear in July 2016. 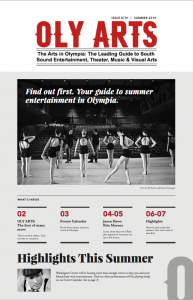 The 18-page summer issue of Oly Arts will highlight Capital Lakefair, Music in the Park and summer theater performances in Olympia. Future print editions will focus on the Olympia Arts Walk, Procession of the Species and other artistic and performing arts events in the South Sound. The print edition of Oly Arts will appear quarterly and will be distributed at venues and at regional arts and cultural events. Oly Arts was conceived by Olympia-based novelist Ned Hayes, who has previously been a key manager for major media publications, including C-SPAN.org, Wizards of the Coast “Magic Online” and PGA Tour Online. Hayes has subsequently led teams for Microsoft, Adobe, Vulcan, and Xerox PARC. He is now a senior product manager for Intel. Hayes was a working journalist and publications manager prior to his current technology career. Oly Arts publisher Hayes serves on the board of the Washington Center for the Performing Arts. He is also the author of multiple novels. His young adult novel The Eagle Tree was the #1 bestselling YA book on Amazon.com’s e-book list in April 2016 and will appear in print in July. The novel has received acclaim from Sherman Alexie, Temple Grandin, Steve Silberman and many other reviewers. The managing editor of Oly Arts is local journalist Christian Carvajal. Carvajal is the author of the satirical thriller Lightfall which has been a bestselling book at Olympia bookstores. He is a frequent contributor to alternative weekly The Volcano and Creative Colloquy. In 2015, Volcano readers voted Carvajal to be “Best Writer” in the Olympia area. Committed contributors for the OlyArts.com website and print editions include experienced local writers whose work has appeared in the following publications: Guy Bergstrom (New York Times About.com), Molly Gilmore (The Olympian, The News Tribune), Alec Clayton (The News Tribune, The Volcano), Christian Carvajal (The Volcano), Jennifer Crain (Thurston Talk, ParentMap), Kelli Samson (Thurston Talk), and Ned Hayes (The Seattle Weekly, The Bellingham Herald, The Olympian). Oly Arts is a publication specifically targeted at an active and engaged population in Washington State. Washington State has a significantly higher percentage of the population who attend live performance events than the national average (44%-52% compared to U.S. average rate of 37.4%). Oly Arts also plans to target the large population of readers in Washington State – 63% of Washingtonians read literature, compared to the national average of 47%. Nationwide, the arts have a large reach: 54% of adults attended live music, theater or other performances in 2015 – a number equivalent to 120 million people. In fact, in the United States at large, 51% of adults attend performing arts, while only 46% participate in sports or exercise. According to the NEA, the arts also contribute an annual $698 billion to the U.S. economy, an amount that outstrips both construction ($586 billion) and transportation ($464 billion). More information about the publication Oly Arts can be found at OlyArts.com. (Sources: NEA 2015 “Decade of Arts Engagement” / NEA 2015 “States of Engagement by Geography”).